‘I am sure it is true,’ said Phyllida. ‘I cannot agree with you,’ answered Norman. ‘Oh, but I know I am right,’ she replied. ‘I beg to differ,’ said Norman sternly. This is the kind of stuff that appears in real people’s books. I know this will never be a real book that business men in trains will read, the kind of business men that wear stiff hats with curly brims and little breathing holes let in the side. I wish I knew more about words. Also I wish so much I had learnt my lessons at school. I never did, and have found this such a disadvantage ever since. All the same, I am going on writing this book even if business men scorn it. All the same, Weiner keeps on writing her books, just as the narrator of Our Spoons Came from Woolworths keeps on writing hers. Both, it seems, have their own bookish mission that doesn’t depend on the approval of men in hats. Does that mean that they both write “women’s fiction“? Is that fiction for women or fiction about women, or some third thing — perhaps, fiction that feels a certain way, or faces in a certain direction — or is the category an artificial imposition, not a real thing at all, though the label persists — and has its side-effects, many of them undesirable? Our Spoons Came from Woolworths has many of the qualities often (usually pejoratively) assumed to define women’s fiction: it is undemanding in both scope and style, focused on the domestic and romantic life of its protagonist, Sophia. “I told Helen my story and she went home and cried,” is its unexpected and enticing beginning; that story turns out to be the story of Sophia’s unhappy, impoverished marriage to Charles, a dedicated but unsuccessful painter. The novel follows her through three pregnancies, an affair, a divorce, and an eventually happy remarriage. But if one supposedly defining quality of women’s fiction is a feel-good sentimentality, Our Spoons Came from Woolworths rather confounds expectations. It’s not that the novel is consistently grim or tragic, but the private life it depicts is — uncomfortable, is the best word I can think of. Two nurses came and examined me. I heard one say it would be about two hours before the baby came. Two more hours seemed an awful long time. The pains got much worse again, and I tried saying ‘Lord Marmion’, but they told me to be quiet. I longed to cry out, but knew they would be angry, so bit my hands. There are still the scars on them now. My hands seemed to smell of Grapenuts and I remembered a white dog we used to have when we were children and she kept having puppies all the time — I felt very sorry for her now. They gave me a bowl to be sick in and I managed not to get any on the bed, but without any warning the wicked castor oil acted and I was completely disgraced. The nurse was so angry. She said I should set a good example and that I had disgusting habits. I just felt a great longing to die and escape, but instead I walked behind the disgusted nurse, all doubled up with shame and pain. I don’t feel much like writing about the actual operation. It was horrible, and did not work at all as it should. I couldn’t go to hospital, because we would all have gone to prison if I had. Even the doctor did his best to help me recover, although he was scared stiff to come near me when he saw it had all gone wrong, but eventually I became better. But my mind didn’t recover at all. I felt all disgusted and that I had been cheated from having my baby. but I loath this domestic life. The children are quite beautiful, but they don’t mean a thing to me. I don’t feel like a father and have never wanted to be one. I may be inhuman and selfish, but I must be, life is so short, and the young part of our lives is going so quickly. I must be free to enjoy it and not be weighted down by all these responsibilities. This had never happened to me before, and gave me great confidence in myself, but now I know from experience a lot of men listen like that, and it doesn’t mean a thing; they are most likely thinking up a new way of getting out of paying their income-tax. I don’t think Sophia is sly or unreliable, but she often gives the sense that there is more to her story than she is telling us — emotionally, not literally. I think that’s because of her retrospective narration. As she tells as at the outset, after all, she’s happy now: “I seldom think of the time when I was called Sophia Fairclough; I try and keep it pushed right at the back of my mind.” Though she’s recalling her unhappy past, she’s also, paradoxically, repressing it, minimizing her feelings about it. The overall effect is unstable or uneasy, then, rather than unreliable. The elements of the book that are most concrete are the material ones: it is extremely specific about, for instance, how far a pound or two does or doesn’t go when you’re trying to house, clothe, and feed a family of three or four. Sophia herself only becomes really distinct as a character at the end of the book. She works as an artist’s model for most of it, which aptly reflects the insignificance of her own perspective and agency in directing her life. Near the end of the novel, she finally looks intently at herself in a mirror. “I looked almost beautiful,” she says, and somehow it seems about time. 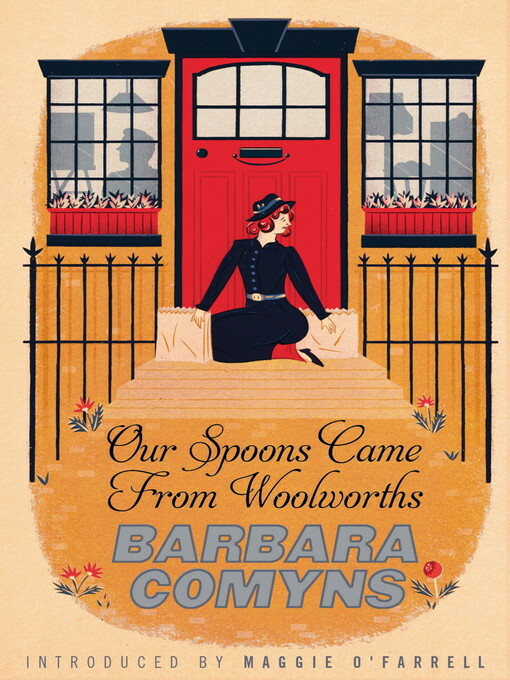 Our Spoons Came from Woolworths is definitely a novel about a woman, then, and about the physical and psychological experience of being a woman. There’s no reason that should be a particularly comfortable kind of fiction (if anything, as history teaches us, it hasn’t usually been a comfortable — or comforting — experience at all) — but if that’s what the label “women’s fiction” means to most people, it definitely doesn’t apply in this case. I kind of think it should apply, though, if only to destabilize the marketing category. The downside would be that if we called it that, men in hats might not read it. They should, though: it’s a real book, though a strange one, and what’s fiction for, if not to be at least sometimes estranging? It’s interesting that she uses the phrase “a kind of Peter Pan complex”; I’ve always thought the term as a way of describing the behavior of grown men came from the 1980s. I knew that this was an older book: Goodreads indicates it was first published in 1950; that may be even before Jung applied the term puer aeternis to the concept. I just had a chance to read this post thoroughly, and I wanted to comment (and I recognize my comment is about a tangential point). I think in defining the kind of work Jennifer Weiner writes, you are right to suggest that she does not write serious minded literature. I think a lot of novels today that touch on topics that Jennifer Weiner does, such as women’s relationships and family relationships, can be categorized in the way that the New York Times article you linked categorizes them. I am a woman, and I do not have much interest in reading books like these. I recall Diana Athill mentioning in her memoir that she no longer has time for so much fiction because it tells the same stories of romance. I think there is some truth in that. However, I am currently rereading The Portrait of a Lady, which ostensibly is about a young woman and her relationships and romantic attachments as she travels in Europe. Why is it that this book seems so much more profound? And why is it that this book would be serious enough for a man to read? I don’t think because it is written by a man that makes it more appealing to both genders because the same things could be said of Edith Wharton’s House of Mirth or Custom of the Country or any of Fanny Burney’s work or Georg Eliot’s work (I could continue on an on). In addition, there are several modern works of fiction that are written about women or from a woman’s point of view that I think are works of substance (two that I can mention off the top of my head are Outline by Rachel Cusk–which I really liked–and By Blood by Ellen Ullman). I don’t know what the answer is, but I think you raise an important point, and I know you have raised similar issues before about what is literature on your blog before. I think I stand in the camp of wanting to read only the best (and by this, I mean the classics) although I will read works by certain people like Franzen (I have read The Corrections and Freedom–and I intend to read Purity) even if there is something lacking in their work at times. However, I did put my foot down with The Goldfinch and could not read past the middle of the book because it was just too boring and poorly written. I haven’t read this (it’s on my list), but I would highly recommend Comyns’ “The Vet’s Daughter”. It is also, at least partly, about “the physical and psychological experience of being a woman”, but has a lot going on stylistically, with a healthy dose of what might be termed surrealism. I have read The Vet’s Daughter, actually – it was my first experience reading Comyns. If you click on the “Comyns, Barbara” tag at the end of this post, it will turn up my post on that novel. I definitely found it interesting — and strange, which seems to be par for the course with Comyns!